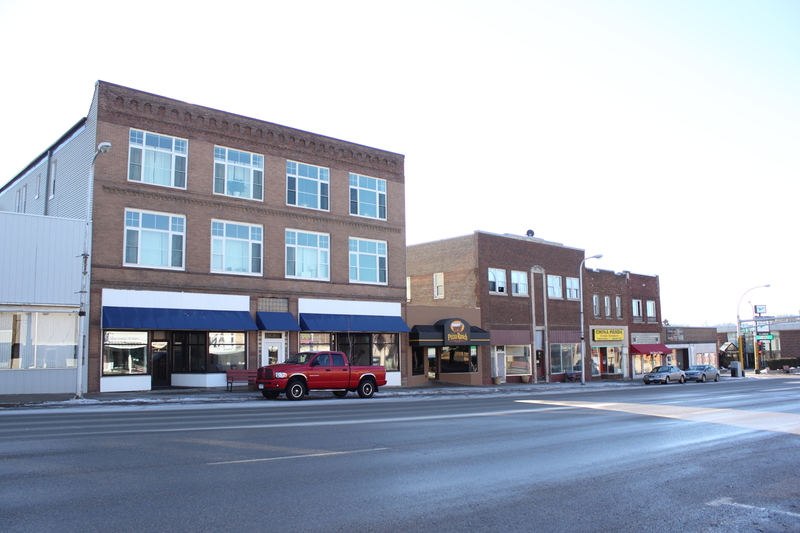 According to Steve Nestor’s research and the tax records, the bank was located on lot three of block 24, which would put in on the south side of East Minnesota Avenue. The land was owned by Ole Peterson in 1876. 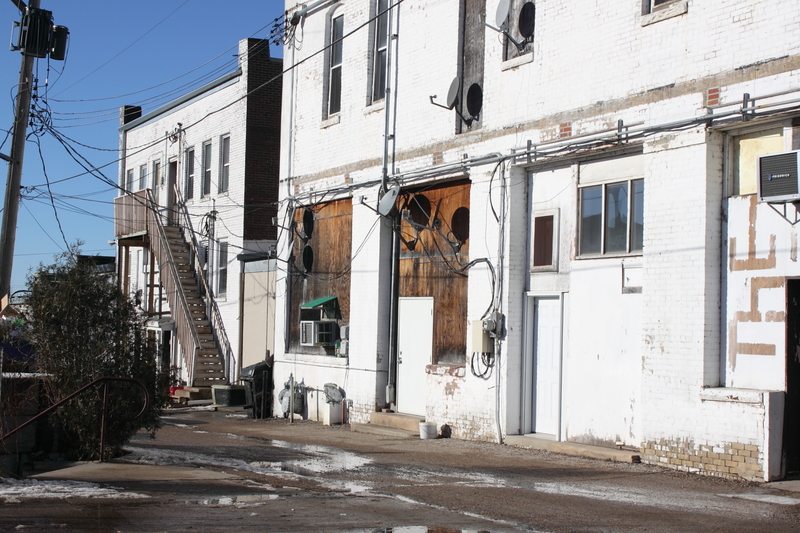 It faces south, so it sits where the Pizza Ranch restaurant is currently located (in 2015), but it faces what is now the alley. Minnesota Avenue did not exist yet and most of the commerce took place on what would become Franklin Street. BUT – According J.G. Whittemore in 1940, it was “Glenwood’s First Bank Building. Located on Lot 3 Block 20, owned by Dr. Whittemore and Company in 1876. In 1882 it was sold to Mr. A. Webster, Mr. Tory Thorson, and Mr. Peter Peterson and operated under the name The Glenwood Bank. Later it was organized into the First National Bank, the old one torn down and a new one built which was owned by George Koplos. 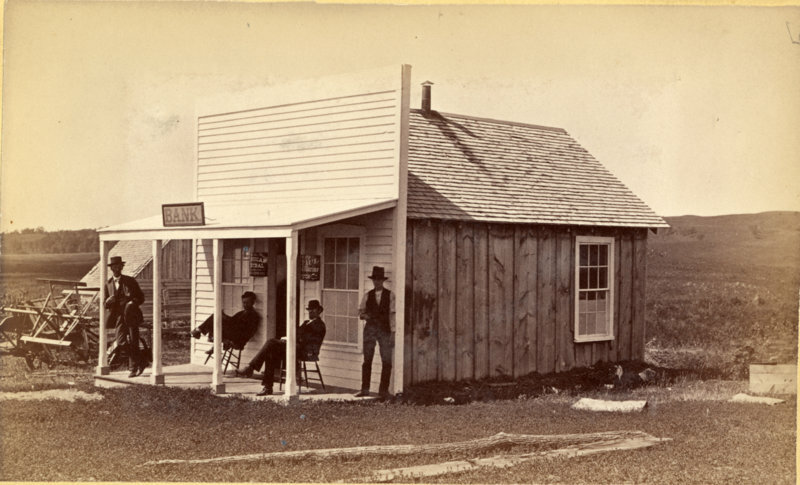 Pictured from L-R: Peter Peterson, Mr. Otis, Mr. Durkee, and Mr. Emerson.” Lot 3 of block 20 is the middle of the north side of East Minnesota Avenue, about where the license bureau is today. While Dr. Whittemore was indeed involved in early Glenwood Banking, the tax records are probably more accurate in this instance, as least as far as the location. The overview photo from the Durkee Hotel (to be seen in a later post) also shows the bank to be on the south side of what is now Minnesota Avenue. 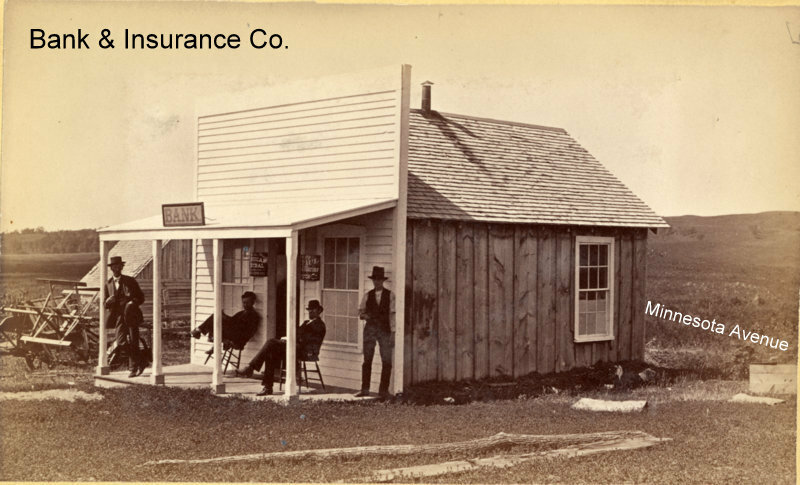 According to a Newspaper report first published in Feburary 1876, the bank was owned by P. Peterson and Dr. Whittemore. There will also be more information on the life of Dr. Whittemore in a future post when we see the photo of his home…stay tuned. The bank’s location as it looks today. Here is a photo of the bank’s location from approximately the same spot. The bank faced what is now the alleyway. This entry was posted in Local History and tagged Dr. Whittemore, Early banks, Early Glenwood, Glenwood Minnesota, Pope County History, Trenham Photographs. Bookmark the permalink.